Max Size: 2.5 - 3"/6-7,5 cm. 2.5/6cm is most common. Company: Does fine with basically any peaceful fish. Aquarium Setup: 10-15 gallons /50-75 L minimum is recommended. Sand or gravel substrate, rough substrate is not recommended. The leopard cory love a planted tank and driftwood. 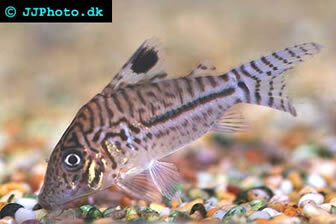 Sexing: Female leopard corys are bigger and heavier and have rounder bellies than males. Their round bellies make their faces sit up off of the substrate when resting. Breeding: Breeding is similar to other Corys, the female carries a few of the eggs between her fins while the male fertilizes them. She then finds a safe spot, usually heavy with vegetation, and hides them. They will continue this process until around 100 eggs have been laid. Soft, acidic water is always helpful and using cooler water for water changes can help to induce spawning. 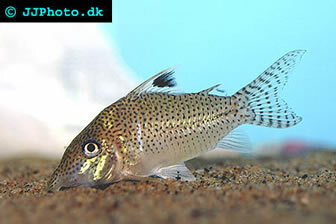 Very similar patterning to Corydoras Trilineatus, but has a much more elongated snout.